A multi-hulled vessel is very stable, a stability naturally achieved by its principle of conception when it is in yachting configuration. to diminish the width to the waterline of the central hull to improve the speed of the boat. to allow the lateral hulls to be integrated under the central one in order to shorten the width for transportation or mooring purposes. Thanks to this exclusive system Triptyque trimarans remain stable in this configuration. In fact the hulls drop 10 cm in the water (on the Triptyque18 for example) when retracted. The boat weighs 250 kg fully rigged and with hulls completely retracted. A 90 kg person precariously balanced on the exterior, or at a distance of 0.80 metres from the axis of the central hull, causes the vessel to list by 10 degrees. The boat weighs 250 kg fully rigged for engine - driven cruising. 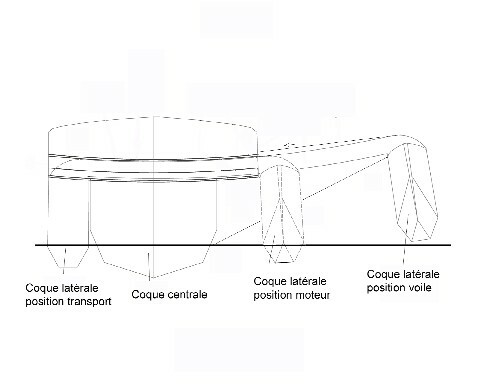 Three people, on one of the lateral floats, weighing a total of 230 kg, or at a distance of 0.80 metres from the axis of the central hull, causes the vessel to list by 12 degrees. These measurements bear witness to a stability superior to the initial theoretical calculation and allow us to confirm the excellent stability of Triptyques 26 and 34 with hulls retracted. In fact this stability offers the possibility of leaving a Triptyque 26 or Triptyque 34 across the set of a wind stronger than Force 11 without risk of capsizing. 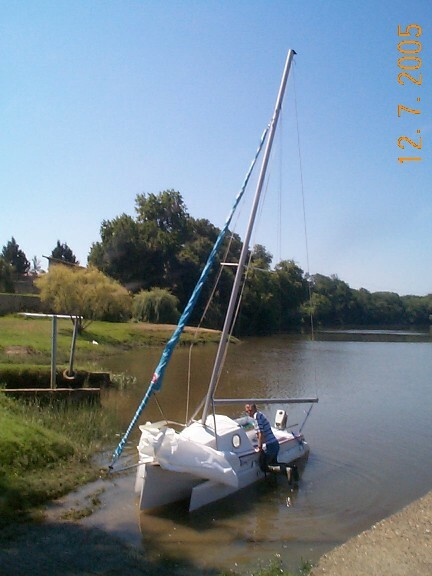 All our trimarans are devised with a permanent concern for simplicity, which is not always easy to effect. Here follow some aspects of the structural planning of our boats which will show how the Triptyque yard finds the best adapted technical solutions at the most reasonable price.